These are award winning cubicles by Knoll ( Knoll Antenna Cubicles). These cubicles are benching style which are made for open concept. Brand new these cubicles would be over $5,000 each. 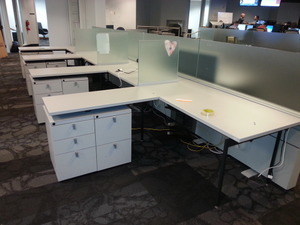 These cubicles including Knoll Fencing Power / Data and glass. Chat online today for your free quote. These will not last long.